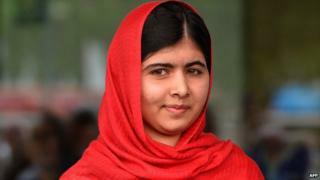 A Pakistani court has jailed 10 men for life for involvement in the attack on education activist Malala Yousafzai. Ms Yousafzai, who was 15 at the time, was shot in the head on board her school bus in the Swat valley in 2012, in an attack that shocked the world. She was awarded last year's Nobel Peace Prize for campaigning for children's rights, despite the risk to her life. Officials say the 10 men, who do not include the man named as chief suspect, belonged to the Pakistani Taliban. Ataullah Khan, a 23-year-old militant, was identified by a police report at the time of the shooting - but he did not appear in the list of 10 men convicted on Thursday. It may be one of Pakistan's most high profile court cases - but there is little information about it and the sourcing is shaky. Someone leaked the court ruling to a television channel, surprising journalists in Swat. A press officer for the military first promised a statement giving details of the case, then backed out. Local lawyers declined to offer comments, and judicial officers feigned ignorance about when or where the trial had been held. There was a similar lack of detail last September when the army first announced it had arrested the 10 men who have now been convicted. It did not say when and where they had been arrested or how they were linked to the attack on Malala Yousafzai. Besides, their names did not include the ones the country's civilian authorities had earlier identified as Malala's attackers. This raised eyebrows, and led to speculation that the army may have been keen to show results at a time when it was in the middle of a major operation against militants in North Waziristan, long demanded by Western powers. The secrecy surrounding the trial and convictions has led to doubts over whether these men are really who the authorities say they are. The men were tried in an anti-terrorist court in Swat, in north-west Pakistan. The BBC's M Ilyas Khan in Islamabad says that no local journalists were aware that the court case was taking place, so there is uncertainty as to the exact charges the men were facing and who the witnesses were. A lawyer from the local District Bar Association told the BBC that "there were no open hearings". Those convicted "had a role in the planning and execution of the assassination attempt on Malala", a police official in Swat told Reuters. Pakistani officials believe local Taliban leader Mullah Fazlullah ordered the attack. He is thought to be in Afghanistan. Ms Yousafzai, now 17, was treated for her injuries in the UK and currently lives in Birmingham with her family. They are unable to return to Pakistan because of Taliban death threats. Pakistan's mountainous Swat valley was overrun by the Taliban from 2007 to 2009. It was the threat by Mullah Fazlullah to close down schools offering girls education that led to Malala's diary for BBC Urdu, which was written when she was just 11 years old. The blog, which described life under the Taliban, was anonymous, but the schoolgirl also began to campaign publicly for children's rights. By the time Malala was shot in October 2012 most militants had been cleared from the valley by Pakistan government forces - but people who spoke out were still at risk. Malala was travelling home from school in the town of Mingora when her bus was flagged down. A group of gunmen asked "Who is Malala?" and opened fire. Two of her classmates were also injured in the attack. Shazia Ramzan and Kainat Riaz have recovered from their injuries and are now studying at Atlantic College in Wales.